HOUSTON, Texas, February 16, 2011 – Controlling conveyor noise at the George Bush Intercontinental Airport in Houston became a serious issue when airport TSA staff complained that the clamor emanating from a conveyor system near their station was making communication impossible during normal work routines. Vanderlande Industries U.S., Inc., who installed the conveyor system at the airport in 2004, was asked recently to correct the noise problem six years after the conveyor system went in. In November 2010, Vanderlande contractors installed Acoustiblok® “All Weather Sound Panels” in the space between the conveyor and the TSA work area, immediately deadening the conveyor-caused sound reverberations and allowing TSA workers the ability to speak and carry out their duties without interruption. Carl Morris, senior project manager for Vanderlande Industries, said the Acoustiblok panels created a significant improvement in the work area for airport staff. “The Acoustiblok is doing a great job, they can hear better and talk to each other at a much more normal level,” Morris said. Conveyor systems like the one used in the George Bush Airport to move baggage from the terminal to aircrafts, are notorious sources of non-stop noise. On any conveyor system, for instance, factors such as speed and the number of moving parts affect the decibel level (dBA) of the sound. Normal conversation is about 45 decibels. Various conveyors operate at different decibel levels, depending on type, construction, use with other equipment and placement in a facility. Many produce noise in the mid-70s to low-80s decibel range, according to material-handling sources. OSHA's noise limit is 85 decibels at ear level. The conveyor at George Bush Airport was emitting noise levels that, while not high enough to be damaging to the staff’s hearing, were high enough to interfere with normal levels of conversation. Airport officials all over the world are working to find ways to reduce high noise levels in their terminals. 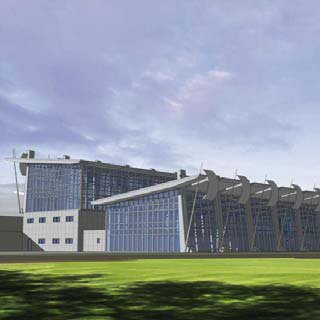 The new, $150 million Sikhuphe International Airport in the Kingdom of Swaziland in southern Africa addressed the problem in advance by designing Acoustiblok into the terminal’s construction. Acoustiblok has been proven effective in reducing industrial and transportation noise exposure. This type of noise often exceeds limits recommended by the World Health Organization and contributes to noise-induced hearing loss. Adding a 3mm layer of the UL-approved Acoustiblok increases a standard stud wall’s soundproofing factor by more than 98-percent. Lead, previously considered the best soundproofing, works on precisely the same basis with the same STC sound reduction rating. For more information or to view a video demonstration of Acoustiblok’s sound deadening capabilities, visit our website at www.Acoustiblok.com, call us at 813.980.1400, or e-mail us at sales@acoustiblok.com. SWAZILAND, Africa – While airport officials all over the world are working to find ways to reduce high noise levels in their terminals, one of the world’s newest airports has addressed the problem during the terminal construction phase. Acoustiblok® sound abatement material has been installed in the passenger terminal of the new, $150 million Sikhuphe International Airport in the Kingdom of Swaziland in southern Africa. Airport designers chose to install state-of-the-art soundproofing material in the terminal of this African nation’s new international airport during the design phase, which began in 2005. Acoustiblok was chosen for its adaptability and performance ratings. Heavy but very flexible, just one thin layer of Acoustiblok’s unique 1/8-inch sound-abatement material added to a stud wall can block more sound than 12-inches of poured concrete. Sikhuphe’s is the world’s newest international airport. Swaziland was formerly serviced by nearby Matsapa Airport, which handles only trans-Atlantic or intercontinental flights and serves largely as a charter airport for small regional carriers. 2005, culminating in its structural completion in July, 2010. 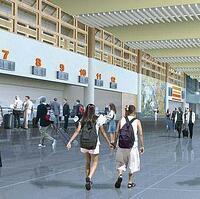 The airport is expected to be completely functional by early 2011. The Sikhuphe airport’s Acoustiblok was supplied by the company’s South African distributor, Able Walling Solutions in Gauteng, South Africa, one of Acoustiblok’s many distributors worldwide. has exactly the same STC sound reduction rating. For more information or to view a video demonstration of Acoustiblok’s sound deadening capabilities, visit our website at www.Acoustiblok.com., call us at 813.980.1400, or e-mail us at sales@acoustiblok.com.